Every week we pull together some great recipes from Canadian food bloggers around the web. This week, one of our favourites: crusty, soft, comforting bread. Whether you eat a single slice warm with nothing but a swab of butter, or you use it as bookends for your favourite sandwich fixings or you just want to tear apart a crusty dinner roll, homemade bread is pure, unadulterated comfort food that comes with a lot of love packed into it. And so, in place of hearts this Valentine weekend, we give you 15 Bread Recipes. Enjoy! Oatmeal Applesauce Bread from [Simple Bites](http://www.simplebites.net/oatmeal-applesauce-bread-recipe/). Sour Cream Dinner Buns from Angela at [The Chewy Life](http://www.thechewylife.com/sour-cream-dinner-buns/). Irish Red Sour Dough Bread from Jared at [The Hesitant Chef](http://www.thehesitantchef.com/food/2014/10/8/irish-red-sour-dough-bread). No Knead Cinnamon Raisin Bread from Jan at [Kitchen Heals Soul](http://www.kitchenhealssoul.com/2015/03/17/no-knead-cinnamon-raisin-bread/html). Homemade White Bread from Barbara at [My Island Bistro Kitchen](http://myislandbistrokitchen.com/2014/01/12/homemade-white-bread/). Portuguese Corn Bread from Carole at [The Yum Yum Factor](http://theyumyumfactor.blogspot.ca/2011/04/portuguese-corn-bread.html). 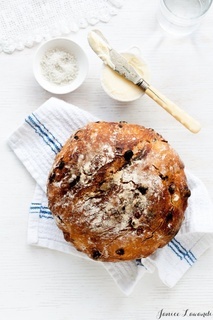 Demystifying Bread from Renee at [Food Bloggers of Canada](https://www.foodbloggersofcanada.com/2015/03/baking-your-first-loaf-of-bread-de-mystified/). Browned Butter Dinner Rolls from Katy at [My Dish is Bomb](http://mydishisbomb.com/browned-butter-dinner-rolls/). Gluten Free No Knead Flax Bread from Lyndsay at [Officially Gluten Free](http://www.officiallyglutenfree.com/2015/11/no-knead-flax-bread/). Easy No Knead Artisan Bread from Chrissie at The Busy Baker. Super Soft Homemade Bread from Kristy at [She Eats](http://sheeats.ca/2014/01/super-soft-homemade-bread-recipe/). No Knead Bloody Mary Bread from Beth at [BethDunham](http://bethdunham.ca/updatesnews/2014/6/8/no-knead-bloody-mary-bread). Irish Soda Bread from Meaghan at [Unassagio](http://www.unassaggio.com/2015/03/12/irish-soda-bread/). Breadmaker Brown Bread (Molasses Bread) from Christina at [I Say Nomato](http://isaynomato.com/breadmaker-brown-bread/). A big thank you to all our FBC Members who participated in this weekend's bread recipe roundup. Bread knots are my favourite glazed with garlic and butter or cinnamon sugar. These balls of glory are easy to make and can be savoury or sweet.